Back in Iceland | So Many Exciting and Beautiful Places! No, we don’t really love cold weather, although the winter temperatures in Reykjavik are frequently higher than in Minnesota. The milder temps are due to the Gulf Stream which carries warm and salty seawater to the coast of Iceland. However, a study from about two years ago revealed that the Gulf Stream is slowing down as more freshwater from melting glaciers is entering the oceans. Time will tell if this is going to have a negative effect on the climate and the fishing industry here. Icelandair offered a package that featured a tour of the Golden Circle and one for the Northern Lights. It was a very good deal, and we booked it for the last week of January, not realizing that it was during a new moon, when the skies are especially dark. Lucky break for some oblivious travelers. 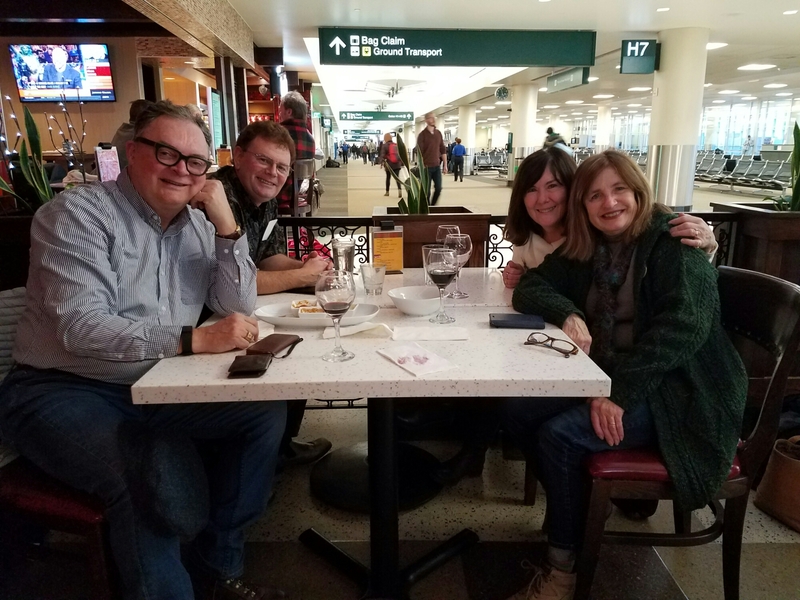 We flew out of MSP with our good friends, Sally and Jeff, at 6:30 pm, and arrived six hours later at 6:30 am in Iceland. We had hoped to spend some time at the Blue Lagoon on our way to the hotel, but it was fully booked. All of those other tourists who also came here for the Northern Lights made their reservations before we did. Bad break for some oblivious travelers. Oh well, our hotel, Canopy by Hilton, was willing to let us check in early. We dropped off our bags and headed to a local cafe for breakfast. Mostly, I wanted coffee and a bagel. Mark went for a more substantial meal to complement his orange juice – total price $45! Prices are high here in Iceland. Next, we visited an ATM to get some cash. In spite of the coffee, our brains had not yet engaged. We thought we were withdrawing about $100. While attempting to nap later (unsuccessfully) my math brain kicked in. Whoa! I think that was closer to $700. Checked my bank account, and sure enough, it was $700. I didn’t think I could actually withdraw that much at one time. So, I’m putting the credit card away for now and will pay cash as much as possible so we don’t have to exchange it at unfavorable rates later on. The exchange rate right now is approximately $87 for 10,000 kroner, so I can take a conservative approach and multiply the Icelandic price by .09, which isn’t too difficult. When traveling east between time zones, I always try to adapt to the new time by avoiding naps the first day and waiting for my normal time to go to bed. That’s especially difficult when it stays dark until 10:00 am and gets dark again at 4:00 pm. We will treasure the daylight for those six hours per day. We slogged through the day, by walking around the area, looking for the shops and restaurants that we recognized from our last visit, May, 2014. There have been several changes, with several new buildings, including our hotel. We see construction going on all over the downtown area. The bed felt so good. Thank you for sharing, Kathleen! What great fun.